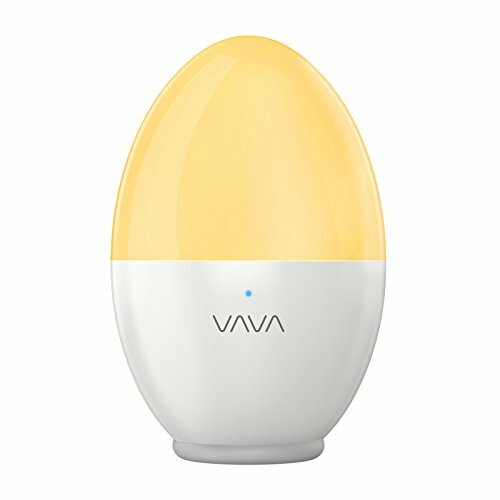 Made for Your Child Designed to be handled (and mishandled) by your kids, the VAVA LED Children Night Light is sturdily made from top-grade ABS and PP plastic to create a 100% safe playing environment for your children. Eye-caring LED Using energy efficient LED to create a uniform, non-flickering light that is easy on the eyes, even for children. Whether you are reading a bedtime story to your children or cuddling a baby to asleep, the light will be just right with its adjustable brightness and color. Learn to Control Let your children interact with the light and have fun playing with its friendly controls: Touch the top to dim the light, touch the logo to adjust its brightness, and double tap to power on/off. Great for Kids and Parents When fully recharged, the light can last as long as 80 hours in weak mode. It is best suited for children's all night companion to keep them feel safe, or for new moms who has to wake up in the middle of the night to give breastfeed. IP65 Waterproof With a portable size, light weight, and IP65 waterproof design, your kids can take the light as far as they can: hiking trip, family adventure, or simply camping at home backyards.